Is Your Favorite Vegetable in the Dirty Dozen™? Another blogging friend to the rescue and I delve into one of my eleven texts required for the CEcD exam. Thank you Inger! A decade ago, the non-profit Environmental Working Group (EWG) unveiled its first Shoppers Guide™ to Pesticides in Produce. The revolutionary list ranked pesticide residues in common fruits and vegetables, forever changing grocery shopping for pesticide-wary consumers. Now updated annually, the new 2014 list was unveiled last week. With this information, should people avoid fruits and vegetables? 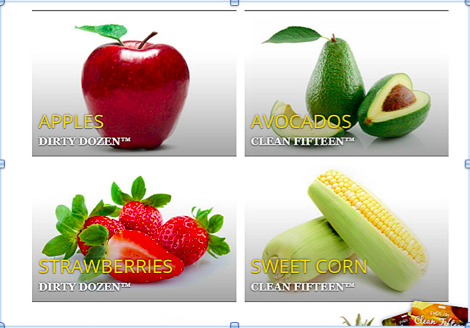 How can knowing the Dirty Dozen™ and Clean Fifteen™ help me? One way people can use this information is to help stretch their food dollar. If your budget is tight, you might buy conventional onions to save money and splurge on the organic strawberries, since strawberries are more likely to have residues. This can also be helpful when dining out. If offered a choice of vegetables, you may select a side of cauliflower (on the Clean Fifteen™) rather than the creamed spinach (Dirty Dozen™). I already buy organic–should I stop now for the Clean Fifteen™? Some Clean Fifteen™ items may still contain residues, so that is one factor to weigh, but my motivation for buying organic goes beyond my own health. I also like to support organic farmers and to consider the environmental impact of conventional farming. So I still chose organic as much as possible. But for those times when organic isn’t available, convenient or affordable, I use the EWG list as my guide to healthier living. Inger Wilkerson blogs about food, gardening, and green living at Art of Natural Living and is beginning her 20th year of CSA membership. Shared on Slurrpy page on fb 🙂 Very interesting Tammy. I have been doing a bit of research myself, on apples after learning that many countries in Europe are banning our U.S. apples. It is absurd that this practice is continuing of toxic pesticides being used when we know they are links to childhood disease such as leukemia . Thank you for this reminder and mindfulness, Tammy. It was timely. Thank you for sharing this. It’s disappointing to see that apples are still at the top of the list, because of the reasons you mentioned (children’s intake of apples in various forms) and because it has been 25 years since Meryl Streep testified in front of Congress about the dangers of pesticides on apples, backed by data from the Natural Resources Defense Foundation. I agree with the idea of buying organic produce whenever we can. these are important lists, as there are unexpected fruits and veggies on both. Now more than ever, it is critical to eat organic. hope all is well, Tammy. We’ve missed you here! Great tips in here, thanks for sharing this blog. Best of luck with your studies! Great post. My family has found the EWG info very helpful as we try to eat organic affordably. Wouldn’t it be nice if one day (soon) organic became the “conventional” way to grow our food! Thank you for this enlightening list. I’m ver conscious to buy organic but good to know which ones are important. OMG, what an eye-opener. Thank you, Tammy. I’m especially concerned to read about apples, since Dave tends to eat them by the “Dirty Dozen”. Best I explore organic options! 1. 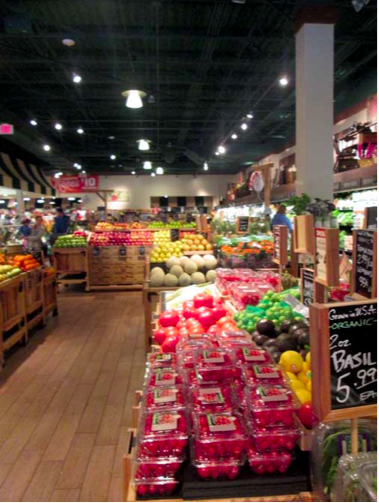 It’s so easy to buy and not consider what is on your produce – or what better choices you have. 2. As a father to three girls, I want to be much more aware of what I’m giving them. I have one girl who is 16; I also want to model good shopping for her. 3. I wish we could all just grow what we need in our backyard. And trade with the neighbors. Now planning huge tranches of avocado-based recipes! Thanks for an informative post! Thanks for the info. I knew strawberries were bad but I didn’t know that apples were so bad. I try to buy organic and will make an even greater effort.